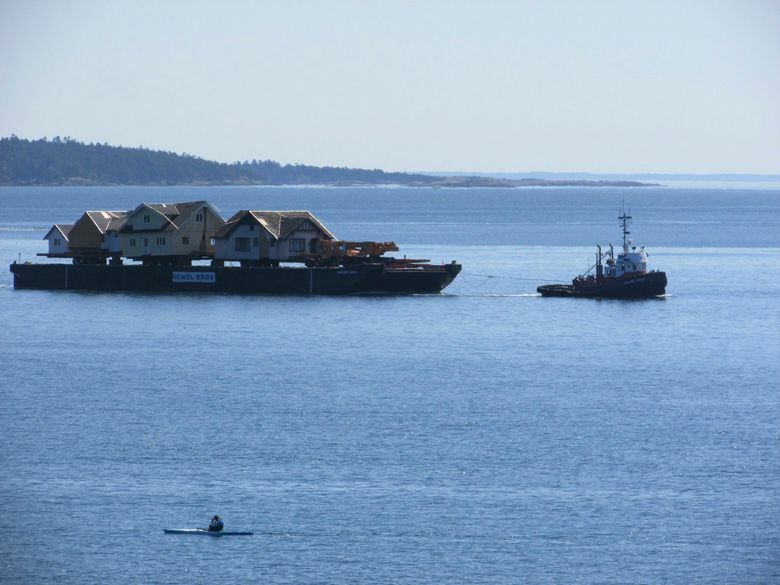 National housing experts said the house-relocation project in the San Juans and another on a nearby island might be the first of their kind. FRIDAY HARBOR — Here in the San Juan Islands of northwest Washington, where a severe shortage of affordable housing threatens the economy and the community, a small nonprofit group has found an unlikely way to help anchor families that are struggling to stay — by lifting up unloved houses in Canada, hoisting them onto barges and hauling them to where they are needed. The houses are small by modern standards and old, built in the early to mid-20th century in a booming suburb of Victoria, B. C., where eager buyers are now clearing the land to make way for new construction. 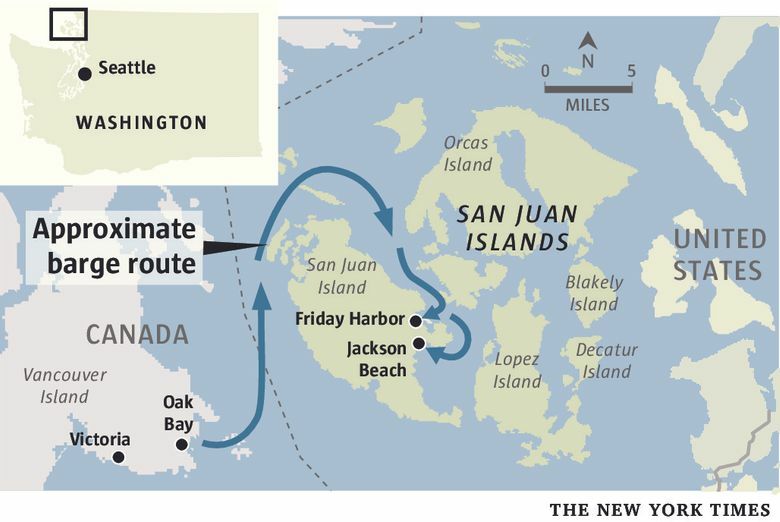 The project met a rapidly growing need: A surge of tourism and vacation-homebuyers in San Juan County — an archipelago of islands about 70 miles from Seattle, reachable only by air, boat or ferry — has gone hand in hand in recent years with a decline in fishing, shipping and agriculture jobs that once supported a middle-class island life. The number of people living in poverty in the county has risen about 17 percent since the end of the recession in 2009, according to census figures, even as the economic recovery in Washington and around the nation gained steam. “It’s kind of life or death to keep our working families here,” said Peter Kilpatrick, the project manager in refitting the houses to be imported by the San Juan Community HomeTrust. When the rewiring, painting and structural repairs are finished in June, buyers who have already met income and residency requirements can take possession. Through a combination of donated land, government and foundation grants and local fundraising, the homes will cost the buyers — a hospital worker, several teachers and a massage therapist among them — from $160,000 to $210,000. The median market price here was almost $500,000 at the end of last year, nearly the same as in Seattle, which made San Juan the least affordable county in the state for first-time buyers, according to the Runstad Center for Real Estate Studies at the University of Washington. National housing experts said the house-relocation project here and another on a nearby island might be the first of their kind. But examples of the innovation that inspired the effort, they said, are easy to find — fueled in many spots around the nation by desperation as homelessness has risen and working-class families have struggled with rising prices and rents, or an inability to find homes at all. Housing advocates in Honolulu, for example, are trying to bring back traditional Hawaiian frond-woven homes as a less costly alternative to wood and concrete. In many other cities, believers in the tiny-house movement are preaching the virtues, and lower costs, of simplified, stripped-down housing. Portland and Berkeley, Calif., recently passed ordinances making it easier for a homeowner to build an apartment in the basement or a cottage for rent in the backyard. Stricter environmental rules now in effect in British Columbia are also making imported homes more appealing and affordable. “You used to be able to take an excavator, crunch a house and take it to the landfill,” said Jim Connelly, the sales manager for southern Vancouver Island at Nickel Brothers, which moves about 100 homes a year on the commercial market and has transported seven so far for the Friday Harbor project and plans to move five more. Now, Connelly said, the province requires hazardous- material reports and abatement, and the sorting of materials from metal to drywall for possible reuse. That has driven up the cost of tearing down an old house, he said, from 3,000 or so Canadian dollars in the 1990s to upward of $40,000 now (about $31,200 in U.S. dollars). The older houses, which will stand within a development of 14 new homes, all suffered varying degrees of trauma in transit. Basements were left behind when the houses were shaved off their foundations. Chimneys were abandoned as well, because old masonry was too fragile and risky to move. In some cases roofs or exterior walls had to be carved away to allow a building to fit under or around obstacles like underpasses or trees. 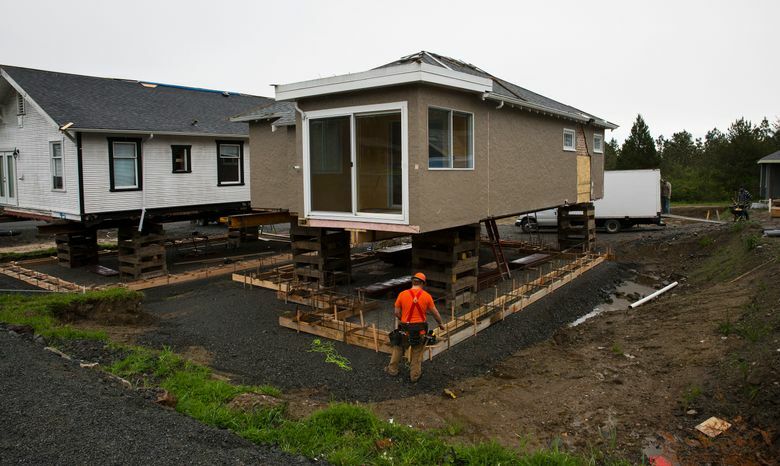 For the moment, the homes sit on steel I-beams and wooden blocks while concrete foundations are poured. In the way of all old houses, they are imperfect and uneven, with parts that have settled and sagged or were never built to exact specifications. Placing them on a level platform, Kilpatrick said, has exposed all of their quirks. Housing experts and board members at the San Juan Community HomeTrust said that beyond cost effectiveness, another appeal of the project was more subtle, but no less crucial: The trust’s financial donors have responded well to the idea that old houses of character are being rescued, along with local families. A Pacific Northwest environmental ethos to reuse and recycle has become part of the fundraising appeal, they said. Few people could be more excited than Kat D’Errico, 37, and her fiancé, Adam Sherman, 36, who qualified to buy one of the houses. Both work at a hardware store, she in accounting while he manages the paint department. To make ends meet, both have second jobs stocking shelves at a grocery store. “The saying here is that you either own three homes or you have three jobs,” D’Errico said. The hard work will continue, she and Sherman said at the hardware store, but a home of their own will provide stability and permanence in a place they love. “This program is great in allowing people — the worker bees of the island — to be able to afford a home, to be able to stay,” D’Errico said.